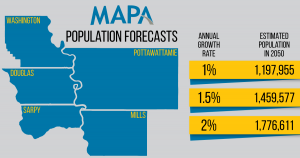 New data from the Omaha-Council Bluffs Metropolitan Area Planning Agency (MAPA) shows if population trends continue, the region, will get more crowded and congested in the next decade and beyond. “Commute times will continue to increase, “said Greg Youell, MAPA Executive Director. But there is a plan for the future and MAPA is working on the best ways to meet the needs of everyone in our community. “We have the bones to build on for the region to expand its transportation infrastructure in a more balanced approach,” said Youell. 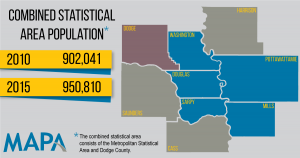 New MAPA population forecasts show if the population grows annually at just 1% the five-county metropolitan area (Douglas, Sarpy, Cass, Washington, Pottawattamie and Mills Counties) will be more than one million people at 1,197,555 by 2050. If it grows annually at 1.5% it will approach 1.5 million and if it grows at 2% annually, it’ll be a whopping 1,766,611. Data from the past nine years back up those trends. 2010 census data shows the eight-county (Douglas, Sarpy, Cass, Washington, Saunders, Pottawattamie, Mills and Harrison counties) metro area’s population was 865,350. But in just five years, from 2010 to 2015, the population grew by more than 5% to 914,305. It gets even larger when you add in Dodge County. The CSA (Combined Statistical Area) was 902,041 in 2010 and grew to 950,810 in 2015. Stephen Osberg, Director of Transportation Development for the Greater Omaha Chamber said the ability for residents to move around the region affects all aspects of life. “When we think of transportation, we often think only of moving people and goods from one place to another, from point A to point B, but our transportation infrastructure also influences the vibrancy of our public spaces, the character of our neighborhoods, and the quality of our lives. In this way, transportation can have as large an impact on social mobility as physical mobility,” said Osberg. So as the region continues to expand and more people move to the Omaha metropolitan area there will be increased pressure on the transportation system to get people to work, school and home again. “We are lucky because Heartland 2050 and Close the Gap have identified several potential priority transportation corridors. Fortunately, those tend to be in key areas with community colleges and universities along the route, which make it easier to add infrastructure and ensure easy access to training and education for the city’s future workforce. Plus, there are several major employers along those key routes too,” said Youell. But planning for the future growth can’t happen without a plan for growing the region’s transportation system. “In the future, competition between companies for workers will grow. Transportation plays a key part in how successful the metro area will be,” said Youell. 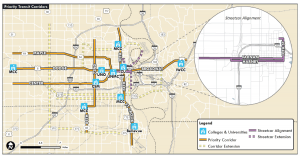 So MAPA is working with the Nebraska Department of Transportation to create MTIS (Metro Area Travel Improvement Study) to identify the transportation network that will best meet the long-term transportation needs of the community. 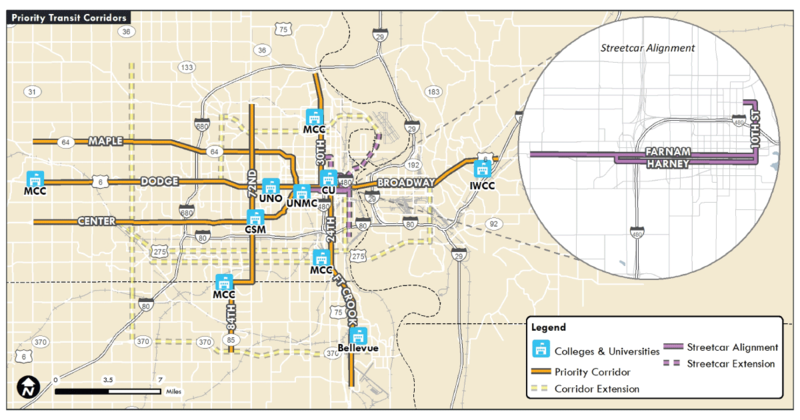 MAPA is also working closely with the Greater Omaha Chamber on the region’s long-term transportation needs. “Our goal is to have a unified transportation plan, so we are going in the same direction and can identify our biggest priorities, and ensure they get the funding they need,” said Youell. Osberg reinforced the need to have a unified vision. “As we continue to build out our transportation system to meet the needs of a growing population, we need to ensure that our investments help shape the community in a way that supports a high quality of life for all of our residents, promotes the seamless movement of freight, and offers lifestyle options that attract and retain talent. This outcome is only possible through the development of a balanced multimodal system,” said Osberg. “There will come a time when you can’t just keep pouring concrete and funding is limited,” said Youell. 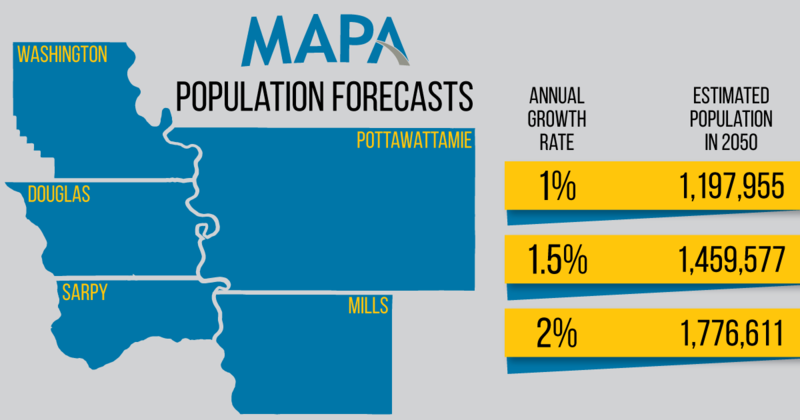 This is why MAPA is dedicated to studying these population trends, trying to figure out exactly what the future holds for both transportation and workforce development so it’s ready to respond and react. “This is not out of reach, it’s all right there,” said Youell.